As you probably already know, I was recently on vacay in Hawaii and had such an amazing time. If you haven't yet, you can read all about my trip to the Big Island HERE. 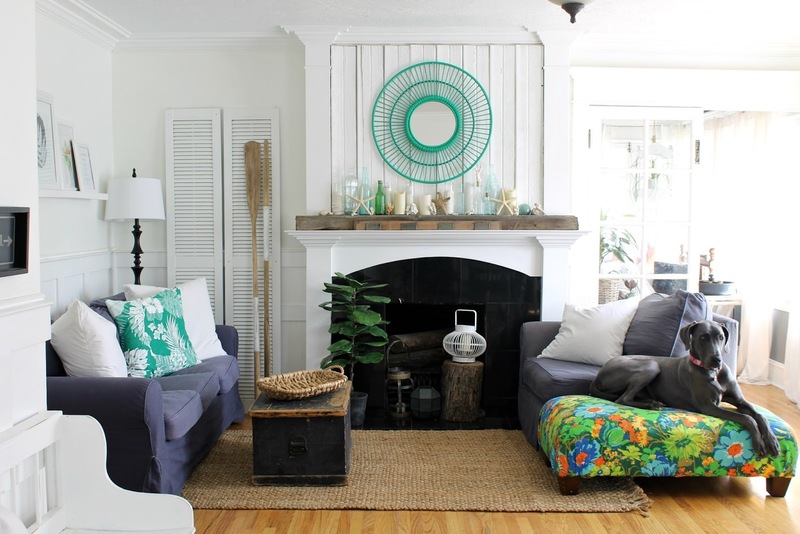 Ever since I got back home from our trip, I've been busy adding beach decor around our living room. 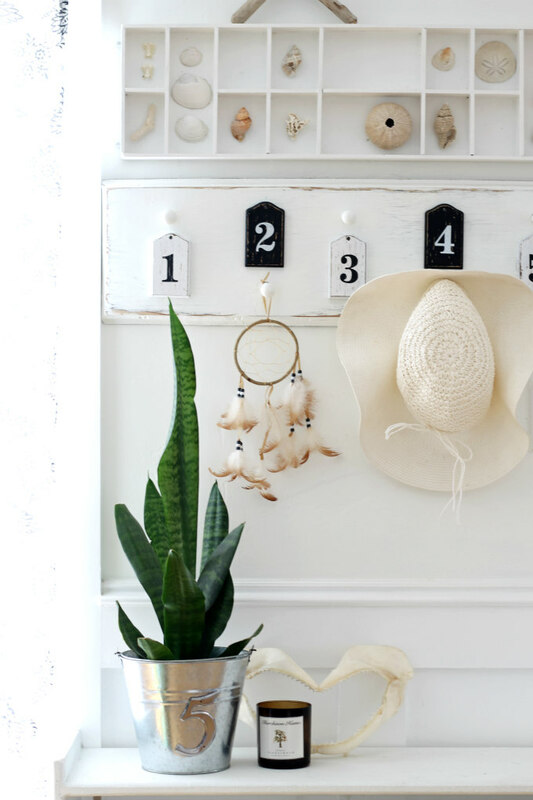 I guess for me, adding these beachy touches is my way to kinda hold on to those wonderful beach memories and try to recapture some of that magical spirit of Hawaii in my own home. 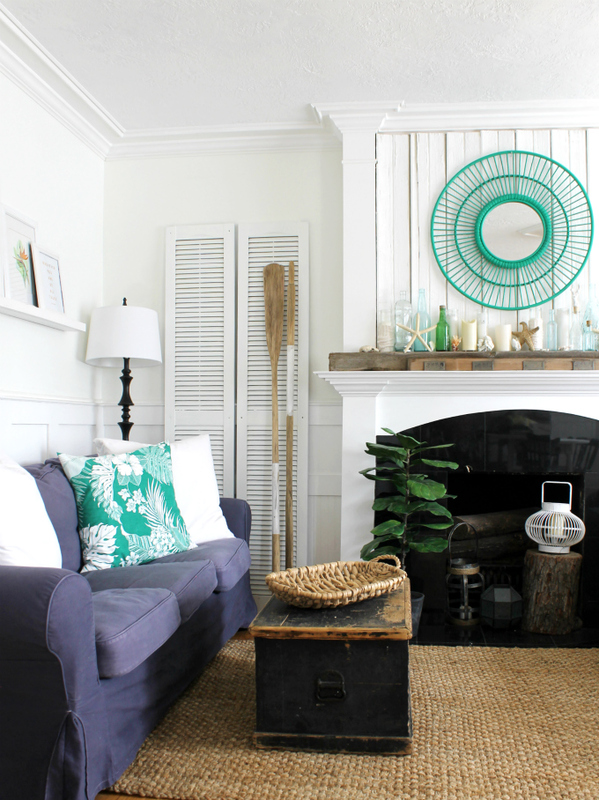 So the first change I made to our living room was painting my rattan mirror green. 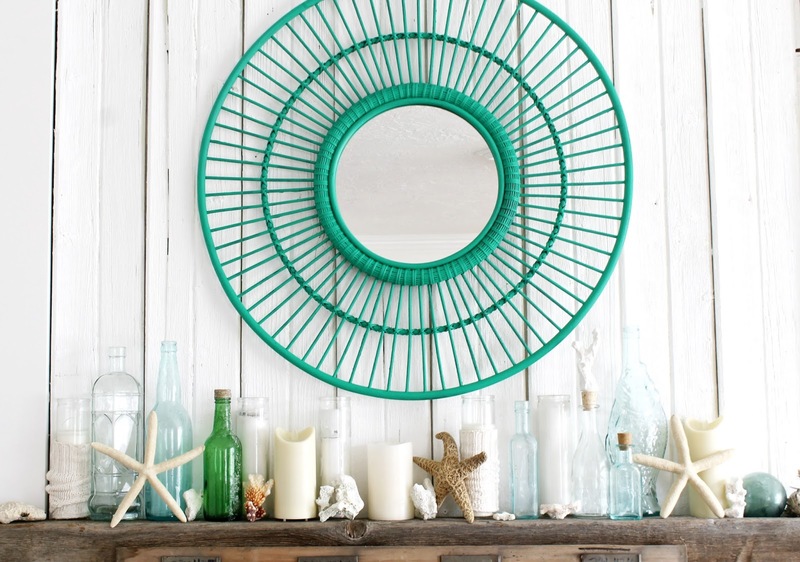 The mirror was from Target years ago, and the paint color I used is called, Mint Sprig by Behr. I think it's such a bright happy green. Don't you? 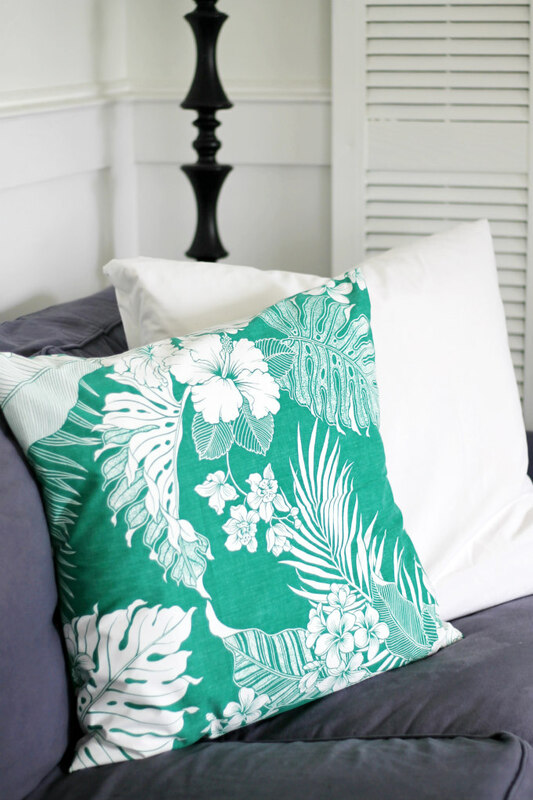 The main reason why I chose this green color of paint for my mirror is because it matches this Hawaiian print pillow Perfectly! I purchased the beautiful tropical print fabric in Hawaii as a souvenir. It's kinda funny that of all the places to shop, I was the most excited to go to a fabric store. I'm telling ya, they had the best selection of Hawaiian prints and for great prices too! I picked up this green print along with a simular one in gray, but now I really wish I had bought more. Well anyway, when I got home I sewed the fabric into a pillow using my simple envelope pillow method. As explained HERE. 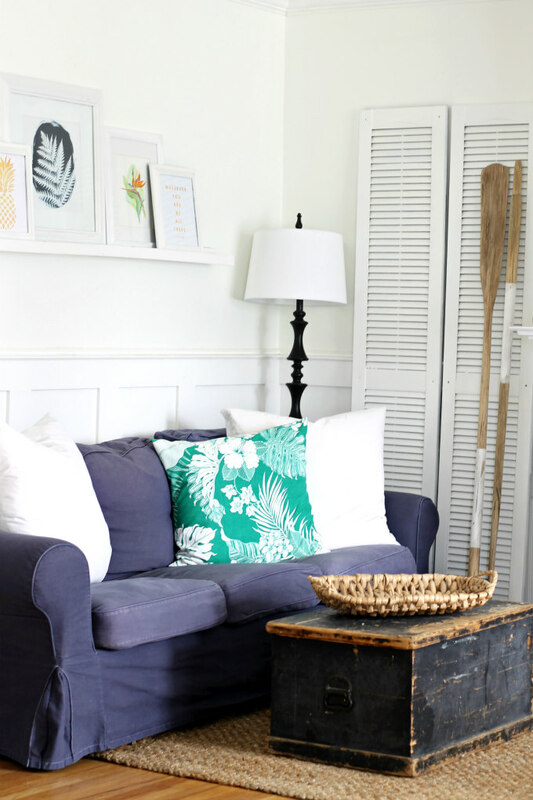 I find the pops of color in the room to be so refreshing. I also switched out the slipcover on my Ikea sofa back to the blue one that I dyed. Instruction for my dyed slipcover can been found HERE. I then had a lot of fun decorating my fireplace mantle. 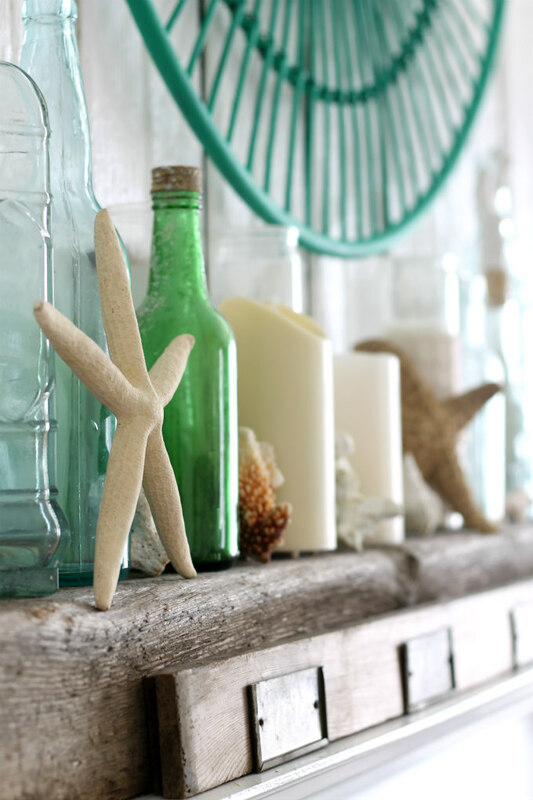 I've had the old wood beam laying across the mantle for a while now, but now I have adorned the beam with sea-glass colored bottles, white candles, starfish and coral. 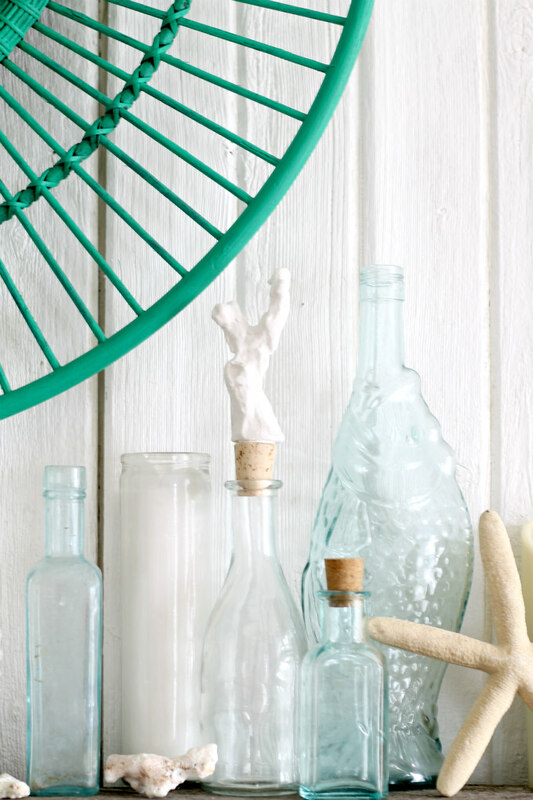 It doesn't get more beachy than that! And how perfect is that coral bottle cork that was given to me from a friend? I love it! Here is a similar one if you are interested. 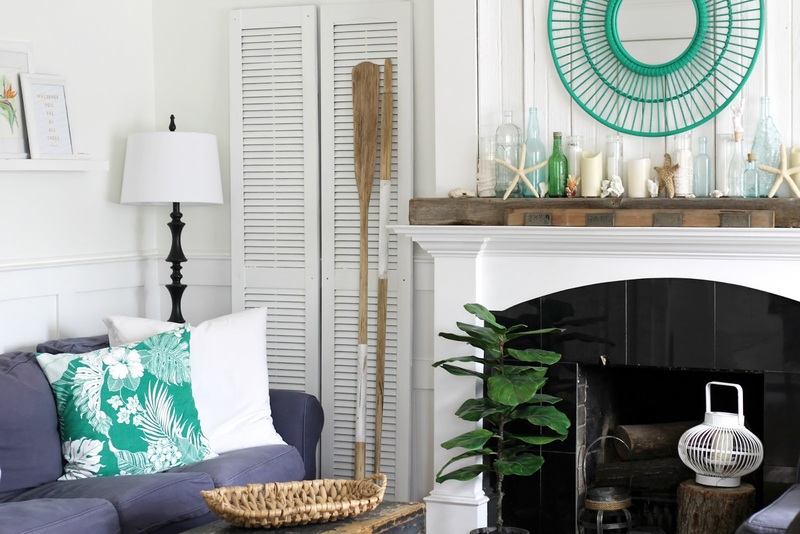 The shutters were up in my bedroom before, but I moved them into our living room to bring more of that coastal look into the room. 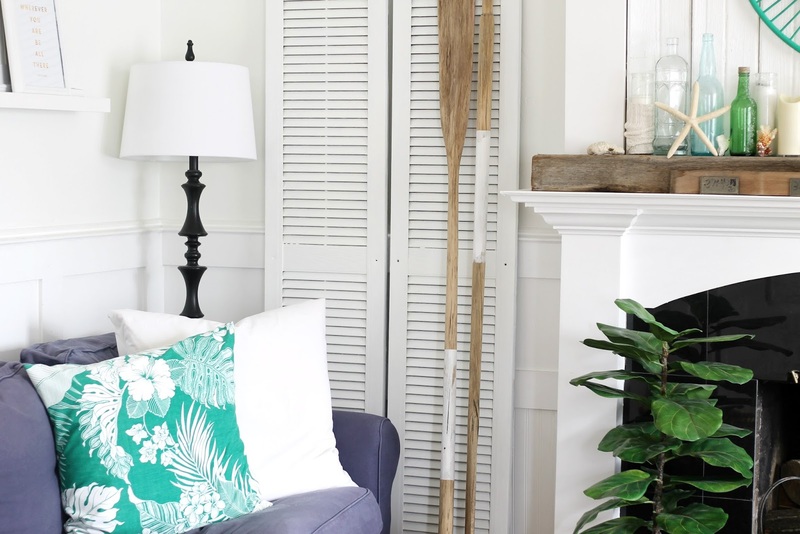 The oars were one of my awesome yard sale finds from last summer. It's hard to believe that they use to look like this? 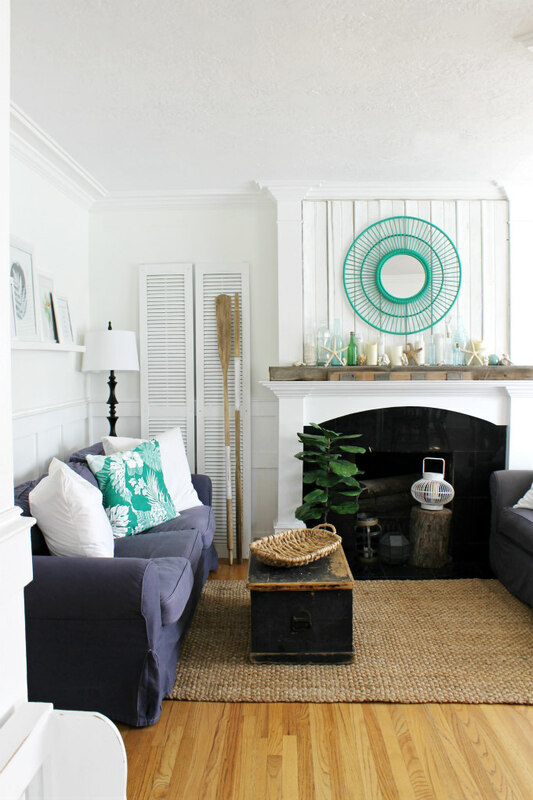 The jute rug is new. I know I talked about it once before in this post HERE. But it's so beautiful that I think it's worth another mention. I got the rug from Natural area rugs and I am 100% pleased with it. 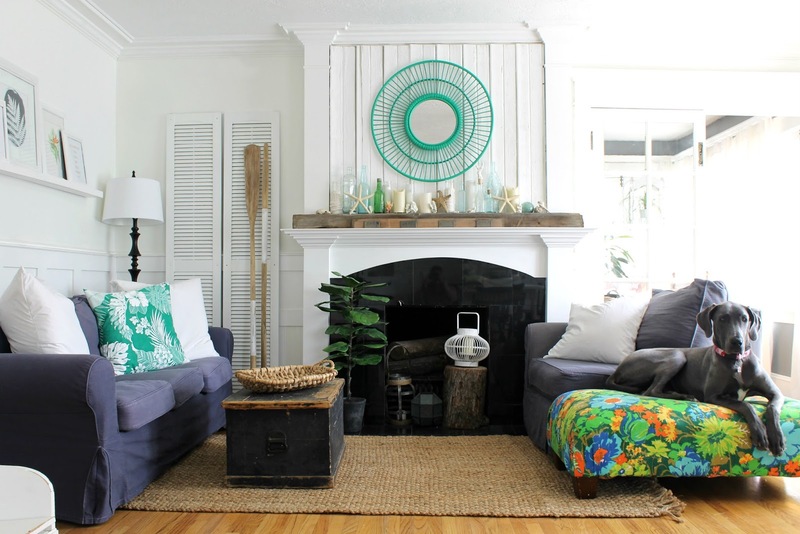 I have always wanted a natural area rug like this one, which is the Paloma Jute Rug. 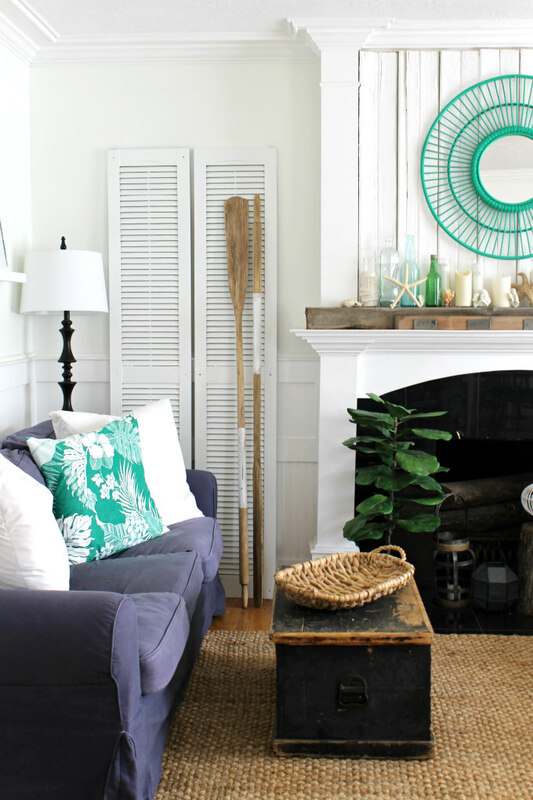 It is surprisingly soft on the feet and really adds to the coastal-beach house look here in our living room. Well actually, there is nothing New about it, except for the upholstery job I gave it. 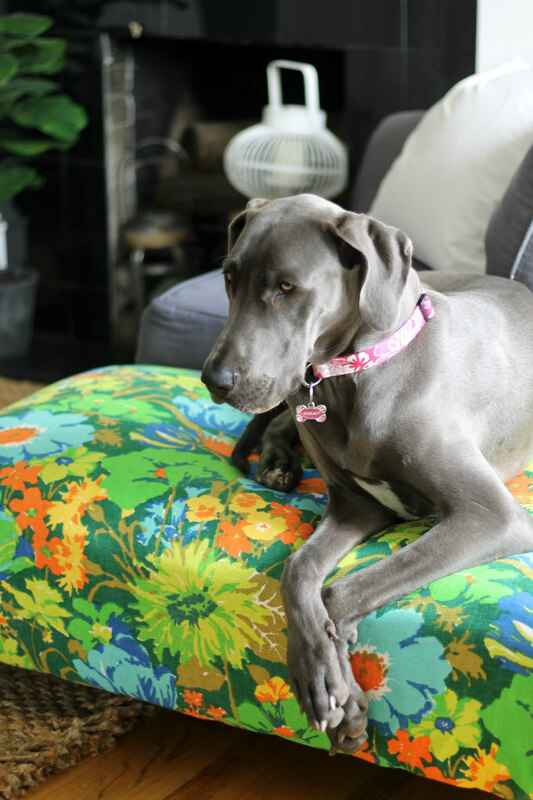 Our Great Dane, Stormy, loves this ottoman and has claimed it as her own special spot which was totally okay until the day she decided to destroy it and rip out all of the foam insides. I tell ya, that was a shocking surprise to come home to! Anyway, You can catch how I reupholstered the ottoman in my saved Instagram story if you'd like, or let me know if you'd like me to share a blog post about it, but for now, I just have to say, the vintage fabric that I used really makes a statement in the room. I think it looks groovy! 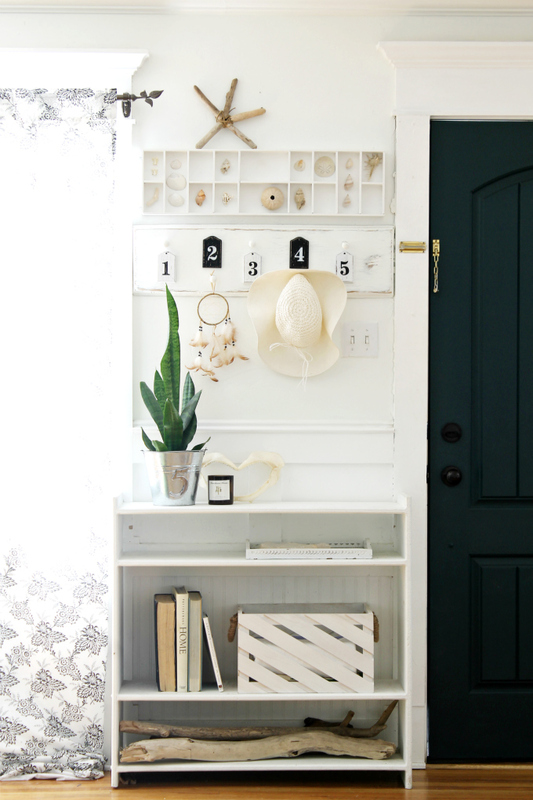 Our entryway is located in our living room. I always enjoy decorating this area for the changing seasons. I thought I'd keep it simple and neutral for spring. You can find my tutorial for the driftwood starfish HERE. And pretty much everything else you see here has come from yard sales. Anyone else excited for yard sale season to start back up? Oh I guess I should also mention, on my DIY Picture Ledge, I have framed a bunch of artwork and free printables. I found the large leaf silhouette print at Home Goods on clearance for a dollar. 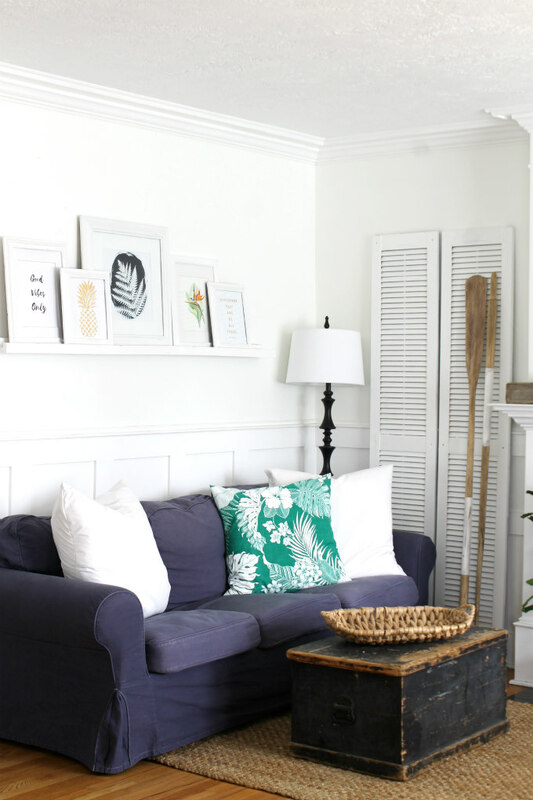 The bird of paradise art is a painting done by my husband's grandpa and the others are all free printable I found while searching Pinterest. 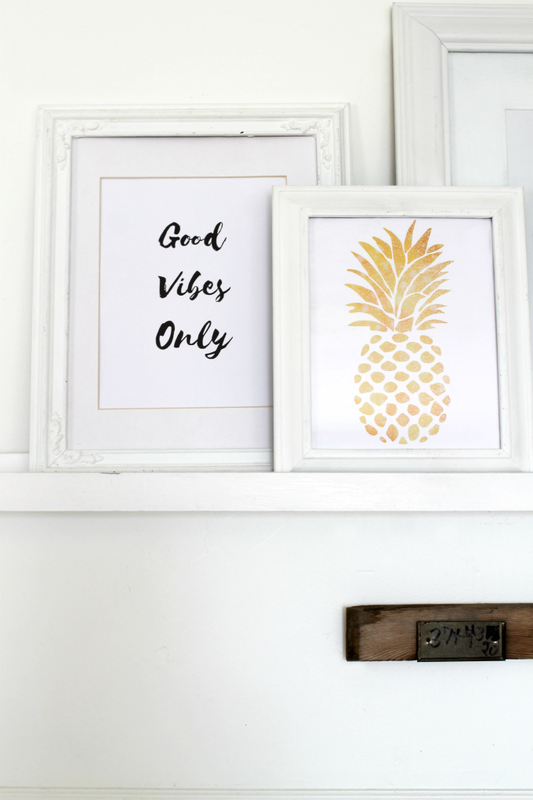 The "Good Vibes Only" Printable was found HERE. The Gold Pineapple printable was found HERE. 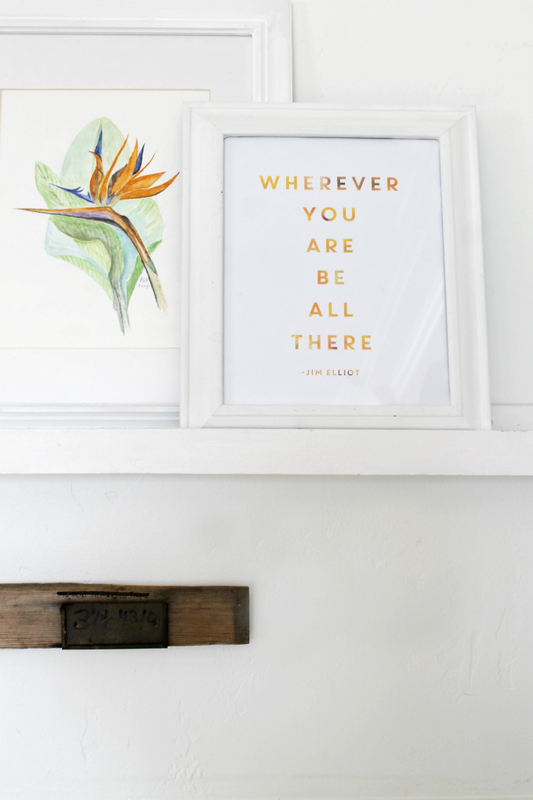 And the "Wherever you are be all there" Printable was found HERE. 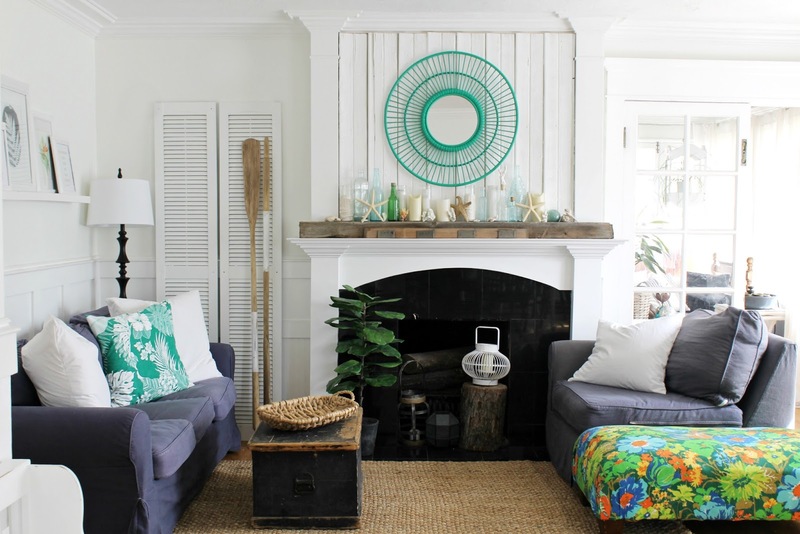 And there you have it, Beach Vibes in our Living Room! Feel free to let me know in a comment below or come chat with me on Facebook or Instagram.